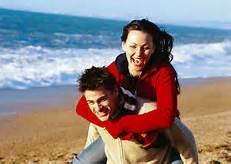 A number of research studies have shown persuasively that people in intimate relationships live longer and happier lives than those who are not. For example, we know that people in marriages or other committed relationships live longer than people who are single. In one classic study researchers found that 95 percent of people who described their parents as uncaring had diseases by mid-life, while only 29 percent of those who described their parents as caring had mid-life diseases. Having supportive and close relationships with parents in our childhoods leads to healthier relationships in general when we grow up, and it is these healthier adult relationships that are linked to a lower prevalence of heart disease and cancer in mid-life. In other words, one can compensate for a deprived childhood by learning later in life how to sustain supportive relationships. In another series of studies, researchers found that people who are socially isolated are two to five times more likely to die prematurely than those who have a sense of connection and community. A study at the University of Texas looked at patients who had undergone open-heart surgery. Those who had neither ongoing group participation nor were able to derive strength from their religion were more than seven times more likely to have died six months after their surgery. Women with metastatic breast cancer were assigned to support groups which met once a week for a year. The women in the support groups lived twice as long as those who were not in these groups. One study has even found that people with fewer relationships of any kind (e.g., friendship, a partner, family, work, social groups, religious affiliations) were four times as likely to develop a common cold as those who had more relationships. Interestingly, research showed that people with pets are healthier than people without them and have to make fewer visits to doctors. Individual Therapy, family therapy or couples therapy can allow you to explore your own deepest and most intimate feelings in a safe and accepting setting with a professional trained to understand these inner processes. The psychotherapeutic relationship allows you to learn to stay true to your uniqueness and feel comfortable in sharing your authenticity with another person. You can explore who can be trusted, and who can’t, as well as the features of your life that may have led you to hide yourself from others. Individual therapy, family therapy or couples therapy all have the potential to teach you how to break out of isolation and loneliness into a world of love and acceptance. It prepares you to explore an intimate relationship outside of the therapy setting.